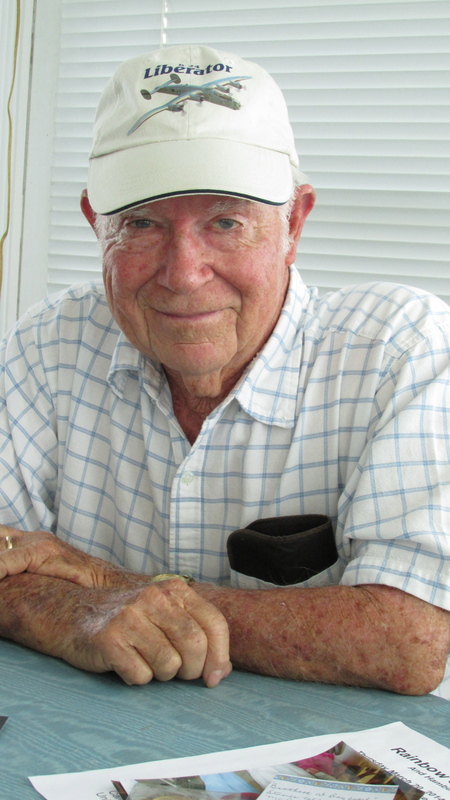 It was their last mission aboard “Betty-J,” a B-24 four-engine bomber named for the pilot, Jack Bates’ wife, that Elbert Bishop of Paradise Park, east of Punta Gorda, remembers most. The crew was part of the 42nd Bomb Squadron, 11th Bomb Group, 7th Air Force. Bishop and the other nine members of “Betty-J” made 12 combat missions on Japanese-held Pacific islands and eventually the Japanese home islands. Their first flight was on May 4, 1945. They bombed Marcus Island, an 11-hour and 20-minute mission, which was their longest. This was Staff Sgt. 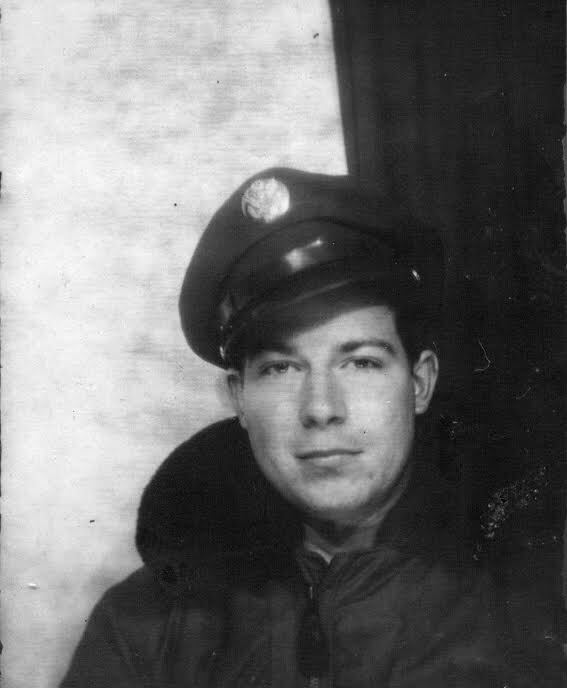 Elbert Bishop, of Paradise Park near Punta Gorda, when he served as a 19 year-old nose-gunner aboard a B-24 “Liberator” bomber in WWII. Photo provided. 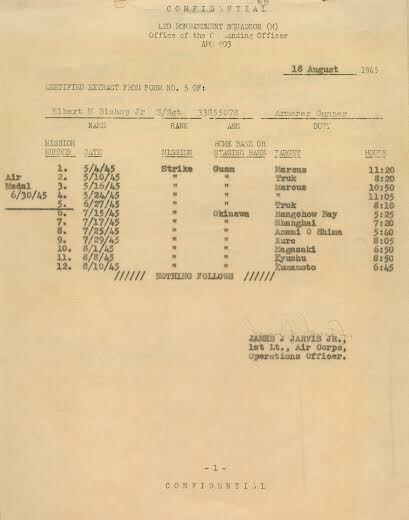 They wrapped up their missions over enemy-held territory aboard “Betty-J’ on a flight to Kumamoto, Japan on Aug. 10, 1945 that lasted six-hours and 45-minutes. This was a week before the Japanese agreed to an “unconditional surrender” to allied forces that took place aboard the battleship USS Missouri in Tokyo Bay on Sept. 2, 1945. “At the very end of the war the 42nd Squadron moved its base of operation from Tinian to Okinawa. We were flying out of there when the Japanese surrender delegation flew into le Shima Island (a small atoll adjacent to Okinawa),” Bishop explained. “Two white Betty bombers with big green crosses on their wings and body brought the Japanese soldiers to the island. The Japanese generals that comprised the surrender delegation got off the two enemy bombers and boarded an American C-54 transport plane for the final leg of their journey to meet with Gen. Douglas Mac Arthur, supreme commander in the Southern Pacific, at his headquarters in Manila. They returned a few hours later, boarded their bombers and flew back to Japan to give the emperor the final account of their surrender activities. Besides their last mission aboard “Betty-J,” where the crew witnessed the final atomic blast that ended World War II, Bishop says their second combat mission to the Island of Truck on May 10, 1945 was also one he hasn’t forgotten despite seven decades have passed since the incident. “This was the mission that the 42nd Squadron lost its only B-24 in the war. One of the bombers in our squadron was all shot up from anti-aircraft flak,” he said. “The pilot of the plane told his crew to jettison everything that wasn’t nailed down. When they finished throwing their .50 caliber machine-guns and the ammunition for these guns and lots of other things out they were still losing altitude. “The pilot then ordered the crew to bail out over the Pacific. All but the engineer parachuted from the plane. With the other crew-members gone the engineer realized the plane had stopped losing altitude. “He decided to try and fly the bomber back to Tinian, their home base. Unfortunately the engineer crash-landed the B-24 and he was killed. Ironically, the other nine members of the crew were rescued by an American submarine and returned safely.” Bishop said. 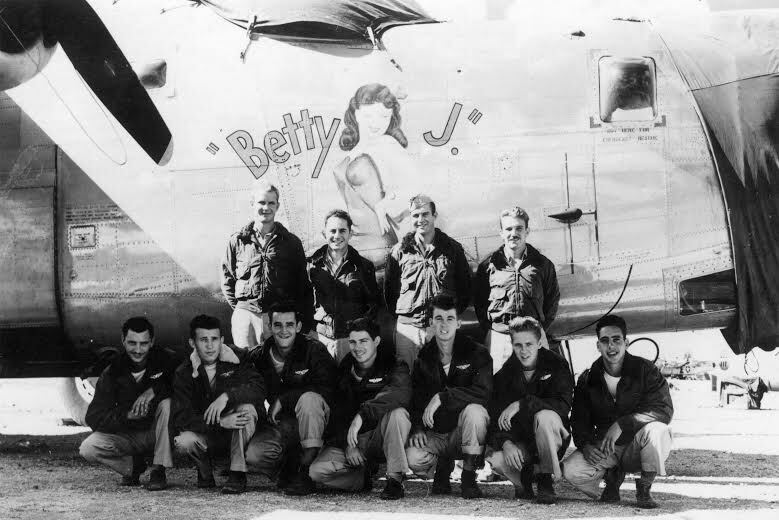 The crew of “Betty-J” was about to fly a 13th combat mission Aug 11, 1945 when they were told the Japanese were on the verge of surrendering. “We unloaded our bombs. An hour or so later the word was that the Japanese weren’t surrendering, it was just emery propaganda we had been listening to. We reloaded our bombs and we were preparing to takeoff once more when we learned the surrender was back on once more. We unloaded our bombs again. 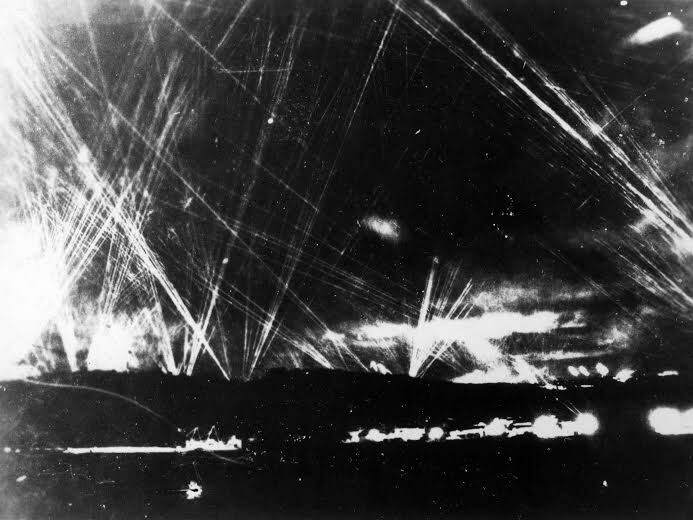 The night the sky over Okinawa was lit up with celebratory gun and cannon fire from celebrating American troops who couldn’t believe they had survived the war. Since “Betty-J’s” crew was one of the last B-24 crews to arrive in the Pacific near war’s end, it was the last bomber crew to fly home. They arrived back in California in early December 1945. Bishop received his discharge from the Army Air Corps on Dec. 11, 1945. The couple has been coming to Paradise Park for the past 28 years. In recent years they arrived at the park in January and return to their home near Kitty Hawk, N.C. the end of March. The Bishops have three grown children: Jackie, Larry and Paul. Name: Elbert M. Bishop, Jr. This story was first published in the Charlotte Sun newspaper, Port Charlotte, Fla. on March 17, 2014 and is republished with permission. Click here to view Bishop’s collection in the Library of Congress Veterans History Project. i met jack bates and betty when they owned mendeltna creek lodge alaska in 1954 jack had a new xk140mc jaguar i raced him with my 1941 mercury he won.